Duck and fruit are a classic flavor combination. 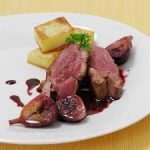 This Duck Breasts with Blackberry Wine Sauce recipe is a great adaptation of a classic dish that is still low in carbs." In small saucepan, combine blackberries, wine, sugar, pancake syrup and half the thyme. Bring to a boil over medium-high heat. Reduce heat and simmer 30 minutes, until reduced by one-third. Strain through a fine sieve into a clean small saucepan, pressing on the berries with the back of a spoon to extract all the juices. Set sauce aside, keep warm. Prepare heavy skillet or preheat broiler. Rub duck breasts with oil and season with salt, pepper and remaining thyme. If you use broiler, place skin side up or if using skillet on stove top, place the skin side down. Cook until skin is browned and crisp, 5 to 6 minutes. Turn the duck over and cook 5 to 6 minutes more for medium-rare doneness. Transfer to warm platter and let rest for 10-15 minutes. Cut breasts crosswise into thin slices; pour sauce over duck and sprinkle with chopped parsley.